It started out a sunny day and because it is the first day of spring, the Loire felt appropriate. The tables on the pavements outside the restaurants and bars were all festively dressed in spring attire….with little knee blankets, and cushions, pots of springflowers. 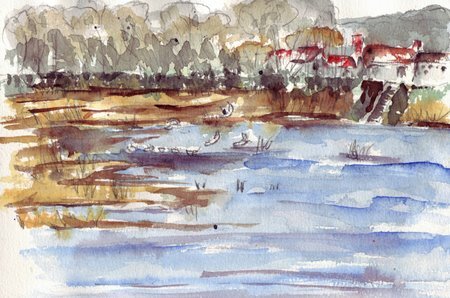 A quick first sketch of the Loire in the moleskine with pen and a wash and then I thought my watercolours weren’t going to be too bad…. 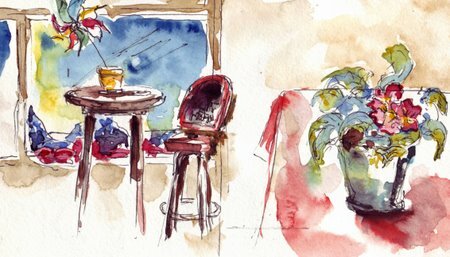 The same scene as the wash, in watercolour, sketchbook 19x 25. 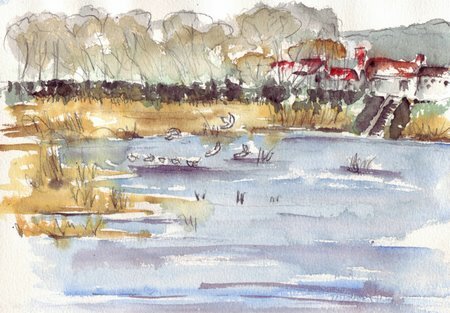 I’m not happy with either of the watercolours…just doesn’t look like the Loire! I have a lot of work to do in landscapes! I think they’reall charming and beautiful — there is a spontaneity in these, Ronell that just makes me swoon! I LOVE THEM! I think they’re wonderful! Beautiful images, but then I really like all your work. They are lovely and springy and so spontaneous!! I especially love your water in both your landscapes and in the pen and ink the spatters of vegetation at the edge of the water are beautiful. It’s nice to see your springy colors in the top painting….we’re expecting snow here for Easter…. it’s cold! I think you’ve captured a lot of the atmosphere of the Loire here, Ronell. I especially like the last one. 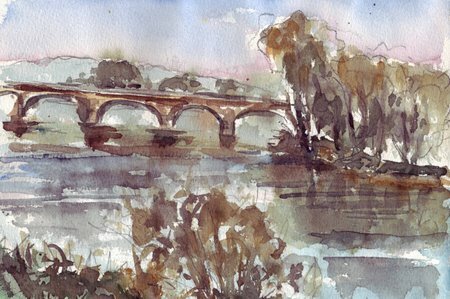 Of course you could spend your whole life painting the Loire and every one would be different – just like the river itself looks different every day, every hour. You are so lucky to see that from your windows, and smart enough to take advantage of it in your paintings. I don’t know how I missed this post before. What a wonderful idea, knee blankets for outside tables! 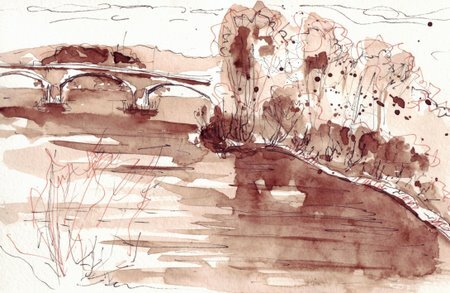 Your monotone river sketch is my favourite. It really highlights the architecture of the bridge. But as usual I’d love to own them all.